Alhamdulillah. All praises to the Almighty, I'm better now and I'm able to be back here to write on my dearest diary. At midnight last night, I decided to blog again. To those of you who have been here before for the past 10 years, welcome back. If this is your first time here, welcome to this personal space of mine where I share my thoughts, what I feel, or whatever it is that that comes to my mind that I want and choose to express. It has been a while, a long while really and I would like to share briefly what happened. Why I have been away and how could I be away from work for the past 8 months. Never before would I have thought that this would ever happen. A few days before I filmed the video in my first post of this year, VLOG #1 - Seven Things About Me, I thought I was actually better in terms of my health. From being on the wheelchair for about 3 to 4 months since mid of 2018 and at the same time diagnosed with a few chronic illnesses, in November I was able to walk a few times with crutches for short distances and in December I didn't need the wheelchair as much anymore (except for long distances). It was such good progress. So I thought that I wouldn't need the wheelchair anymore. I had no idea that it was just going to be a short few weeks before I needed the wheelchair again. Since I was better, Khubayb brought me and the kids for a short beach getaway on the very last week of December. I was super excited and then was the happiest to just be surrounded with my family and some of my favourite things, like the beach, sun, sand, and the sea breeze. However, 2 days after being there my body physically broke down. So I had to be in the hotel room as I was immobile most of the time except where I forced myself to go out for a few hours. No complaints though because being sick and lying there was much better than being in the hospital, any day. Bear in mind that I haven't taken the stairs for more than 4 months but at the resort there were a number of stairs that we had to take when we went to the beach, or whenever we went to eat at the hotel for breakfast and dinner and it was the most walking that I did for the first time in months. It was painful and difficult for me but I did it anyways and at the beach Khubayb even helped to carry me down the stairs as it was steep. After two days, it was too much for me and my body broke down. When I couldn't go out and couldn't move about in the hotel room, I actually planned a schedule of blogposts and VLOG postings that I wanted to share for the longest time. I've noted them all down, in a notebook, scheduled it too when I'm gonna post this and that. I even planned to share at least 3 times a week starting January. When I got back from the holiday, I noticed weird things about my body. First, I couldn't move without feeling pain. It was either painful, or stiff and sometimes, both. I literally looked down at my own body and found that it looked weird. Certain parts were swollen and became black bluish which was scary in my eyes and I had bruises that I didn't know where it came from and it looked like certain parts of me were beaten up. It was really painful, I couldn't move much and it was pretty unbelievable to witness it and it felt like I didn't recognise my own body anymore. It was a scary feeling. I made the appointment to see my specialist as soon as I could. In between coming back from the trip and going to my appointment, I tried to publish that first blogpost of the year since the first day I got back but even sitting in front of my computer, just beside my bed in the bedroom for 5 minutes were too painful for me. I had to sit and the lie down every few minutes and that act in itself was painful for me. It took me a number of days to edit and draft the post that I published on 4th January 2019, which turned out to be the first and the last for January. I tried to use my phone to type but even holding the phone for a few minutes caused my arms hands and fingers to be in so much pain. This is despite strong painkillers that I've been taking since mid last year already. So when I went to see the doctor on the first Friday of the year, I was diagnosed with an auto immune disease. On top of the other chronic illnesses I already had. I asked the doctor a lot of questions and some of the answers shocked me. It is still something unexpected but after a series of unfortunate events I think I was a bit more prepared for it. I asked him what's the cure. And he said there is no cure. However, the symptoms are treatable (read : pain killers, physio etc) and the pain, manageable. It is the kind of pain that I have to continue to learn to live with. The whole of January, my original plan to share and blog and at least instagram, didn't happen. I published my last blogpost, "Seven Things About Me" the same day and right after I was diagnosed with the autoimmune disease, only because the post was ready and I added a few sentences to share briefly what happened that day. After that, I had to forget about updating my social media, again and it wasn't even in my mind any more after that as I was focusing solely on learning about the new diagnosis, adapting to it, finding ways to manage and treat the disease as well as looking for alternatives other than western medicine. I tried everything that was offered to me even if I was sceptical about a lot of things before. When you hear the word "NO CURE" you will try everything there is. I was left with no choice. There is no space for scepticism anymore. I read up on it. Researched. Through books and the internet. Obsessed in trying to deal with it. Trying to find an explanation on it and if there is any way to make the pain more bearable. At one point I couldn't even hold a glass of water without feeling pain. I couldn't even wear my rings anymore at one point because my fingers were swollen among otter parts of my body. For a number of weeks, I was stuck to be in the bedroom and didn't even have the energy to walk to the living room of my small apartment. Even taking a shower felt like a marathon, but I made sure I did every single day. I would refrain myself from going to the washroom just because it was too painful to move. My body confined myself to the bed. After some recommendations from those who are going through the same thing, I started to change my diet, eat what was recommended for the disease and avoid those which are bad for me and suddenly there was progress. After a few weeks I was able to go to the living room. The swelling became lesser but I still needed the wheelchair when I went out. That month was hard. Other than the trips to the hospital, I only managed to go out of the house only one time with the crutches but I was hiding and concealing so much pain every time I had to get up. 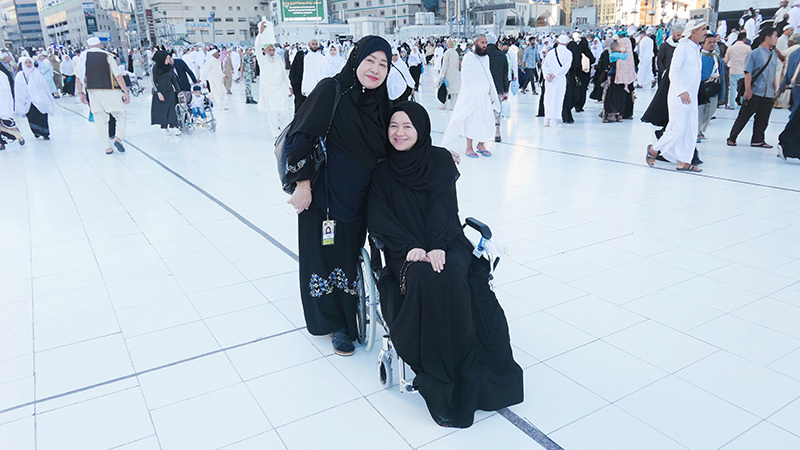 I forced myself to go out another 2 times with the wheelchair for my family as my parents-in-law were going back to Madinah at the time. So most of my time were spent just lying bed in my bedroom, then slowly progressed to lying down on the sofa in front of the TV. This and the frequent trips to the hospital. I was on bedrest. I even started to question the term bedrest at the time. Coz resting should mean that you are relaxed right? But how can you relax when you are in so much pain even in the bed? When you can't move. And I haven't even started to talk about how all this has affected me emotionally and mentally since last year just yet. I'm grateful that God has spiritually, mentally and emotionally prepared me for this from mid last year when I was first diagnosed with the other chronic illnesses. I remember I was so calm on the day I was diagnosed with the autoimmune disease. Rewinding back to mid last year, I remember that I didn't take it so well when I was first diagnosed with the severe chronic illnesses. I was sad. Angry. Annoyed. In denial. Even though it was obvious. I went through almost all the stages of grief. But this time grieving about my own body. The diagnosis became the confirmation of the loss of my health, which at the back of my head I know I had been ignoring and neglecting the symptoms for years. I didn't react the way I was supposed to. I was questioning the circumstances. I know its wrong but that was my initial reaction the first day I found out about it. I lost myself for a bit. I know it wasn't the first time I experienced actually really losing it and more importantly losing myself. But personally I felt that it was the worst as I actually said it out loud and it wasn't just thoughts in my head. I questioned: "Why? Why is this happening to me?" Isn't it enough that I have been in the hospital for over a 100 days in just a few years time? I was searching to blame something. Myself. Everything else around me. Everything. All praises to the Almighty as He saved me and got me out of that shameful stage through a number of blessings. The first was when my cousin Yasmin Ramli visited me few days after I was hospitalised. She shared a number of things that made me realise some ways that I should connect to Our Creator. My mood improved and a few days after that I even blogged "TIME OFF EVERYTHING" while I was lying down on the hospital bed. The second event that saved me was about a few weeks after I was discharged from the hospital after staying there for about 3 weeks, I was invited and called to go to Yasmin Mogahed's 3 days talk. They were truly God sent, both of them. I knew right there and then Allah sent His messages through them and He is saving me through them. Alhamdulillah. My mood slowly changed to be so much more positive and accepting about my illnesses even though I lost my physical mobility in the process. I will be lying if I said that I am positive all the time, but I try to be, despite the negative situation. Also bear in mind that apart from not being able to move, I was also unable to work as well since June last year while I was ultimately focused on getting better and regaining my health and overall wellbeing, or more like fighting and battling my illnesses. So apart from losing my health, I also lost one of the parts of my self-identity. Somehow this time, I felt relieved that I know what was wrong with my body. And somehow relieved that I knew the steps that are going to be taken to treat it and manage the pain. It is not something that I've suddenly been suffering for the past year but actually it has built up for almost 10 years or more. Those who have read my earlier blogpost would know that I've been battling some form of illnesses and I have been hospitalised a number of times but I myself didn't know that I have been having a chronic illness, what more an auto immune disease. I did mention about some of my hospitalisations in "TRAINING AT THE HOSPITAL". So I was actually grateful and that day I decided to totally focus on my health, or battling my sicknesses. Some of the unexplained illnesses and mysteries symptoms I suffered from all these years that the doctors could not diagnose now made more sense. 2 days after that, on 6th January was when I decided to delete my Instagram after I posted my last post. I just uploaded it back into my phone a few days ago. But that, I'm probably going to talk about in another post. That was my January 2019 and the first half of my February 2019, in summary. So again, another "life-changing" situation. I feel like I've been using that term a number of times the past few years. And it reminds me of my own blogpost on 10th October 2018 "LIFE CHANGES". I just read it again now and this 3 paragraphs below is something that I'm feeling again since I was newly diagnosed with the autoimmune disease last January. "Life is short. I was reminded of this when my first child left this world and now again, when I found out about my own condition. It forced me to set my priorities straight when before it was just me talking about it. In ELHAN'S HEALTH SCARE I mentioned how when it happened I felt like it was a slap to my face. And it hit me hard. But this time, with all the things happening this past few months, are just really like MULTIPLE NON STOP slaps, and pushes and kicks to my face, oh no actually my whole body. It really has been one after another in terms of health. It is not all bad though as going through all this makes me realise and learn more about life, about our purpose here, about myself, about my surroundings and the people around me. So right at this very moment I'm thankful for these challenges, trials and tests. Feelings change though. Perspectives change too as life changes. I'd be lying if I said that I'm going through it pretty well or that its easy or that I'm positive about it all the time coz clearly it is a negative situation. And of course now I'm more positive and all accepting about it so thats why I can type this out and share this right now. But honestly there are a lot of times that I don't feel like this and don't even feel like talking to anybody about it or when people ask me about my condition and I don't want to talk about it. I am human. Imperfect and flawed. But even in a negative situation a lot of positives actually come out of it too. We might not realise it but it does slowly make an appearance or sometimes surface, if you trust in His plans for you, and try to look for the positives in every situation"
However, I just want to clarify, again, that it really wasn't all that bad. Absolutely. I also do not want to sound like I'm whining, complaining or being negative. But since it is a negative situation so it is hard for it to not sound negative to others, right? How could anyone call being sick a "positive" situation right? We would never wish ourself or another person to be sick . However, other than being in so much pain to be able to do so, this is another reason I didn't want to share what happened while I was at my worst and lowest. Other than focusing on my health, one of the other reasons I couldn't and didn't want to update my situation was because I wanted to avoid sympathies and pity comments, messages, looks.. Even a small hint of pity from others reminds me that I shouldn't be happy when I have tried my best to keep myself positive. However, I am blessed to receive a lot of calls, emails, direct messages, advice, genuine concern, support and much love from many of you. Thank YOU. I quickly realised that whining, complaining or talking about it won't help at the time I was dealing with it all. Now I decided to talk about it here because I am much much better, overall. Also, even in sickness, hardships and tests, there are the little joys that can cheer you up, make you happy and grateful. This time around, I am blessed to be able to notice and appreciate the little things even in sickness and in pain. For example, even though I can't do what I would normally do as a mom to my babies, like being able to carry them and having sit them on top on my lap, which is something that I just so miss, I realised it was a blessing in disguise that being confined at home allowed me to be around them more. I was able to see and discover the sweet and kind part of how Elhan is so caring and even though he is just over 2 years old. He is so, so kind and understanding towards me. 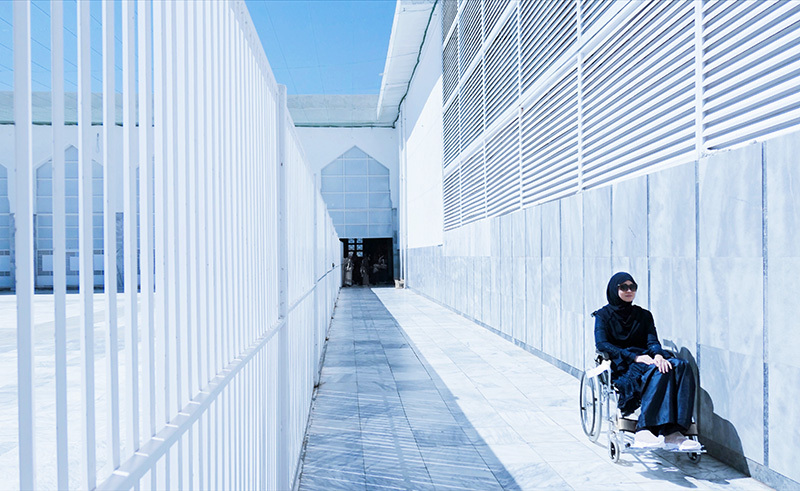 When he sees Khubayb pushing the wheelchair, he usually wants to help. He has actually helped pushed me from my bed to the washroom a number of times without me asking just because he wants to do it. The number of times that he passed me my crutches (and now, my walking stick) it just amazes me how a small little toddler can be so kind and understanding towards what's going on with his Mama. I am also blessed to have a caring, loving and supportive husband, Khubayb. I cannot even imagine how I will be if the position is reversed Nauzubillah. The number of times that he had to push me on the wheelchair. The number of times that he had to help me get up or walk. There are just so many big and small things that I can't even mention because its too private but my point is that he takes such good care of me throughout this whole time and I am beyond happy and grateful to have my husband in my life. We have gone through a lot of bad times and good times in our relationship but this is really something else. It is bittersweet and Alhamdulillah for my husband. I am also blessed to have my parents, my family members and the few closest friends who have been there for me throughout the past 8 months, who came to visit me either at the hospital or at home either accompany me on my bed or on the sofa. That was when I realised I'm very lucky to have precious people in my life who would be there even when I was at my worst and sickest. I will never forget how they have helped me throughout this trying times. I am also blessed to have others who have prayed for me, called me, messaged me and even strangers who have wished me well. May God reward everyone of you abundantly for your kindness, support and love. This is not all. One of the highlights or the blessings is definitely my umrah trip this 2019. I actually wanted to go end of January but as my physical condition was extremely severe the doctor advised me not to go even though I was determined. I wanted to go ahead anyways despite the doctor's advice but there were some other issues so it was rescheduled to the middle of February. My specialist was actually hesitant to let me go even then but I was determined nonetheless because I knew there was no cure to my disease and it is also degenerative and progressive so I wanted to go even more because I don't know what's going to happen a few months down the line. So he increased my doses for my meds and painkillers, doubled my treatments and told me to make sure not to over exert myself. Of course I was so ambitious and wanted to try to walk with crutches for my umrah but he reminded me to keep it real and just accept the fact that I have to hear to what my body wants and can do. It was the third umrah trip for me but it is my first time being immobile and on the wheelchair so it is really different in a lot of ways. 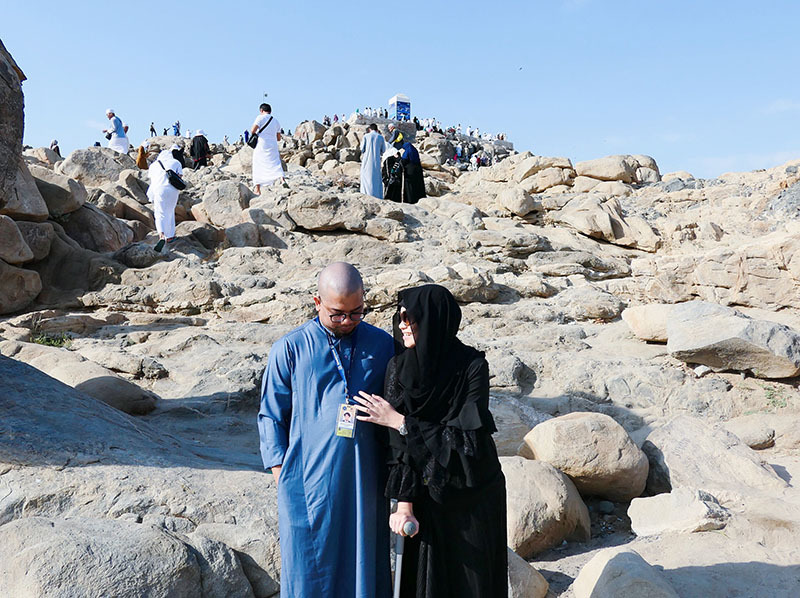 At Jabal al-Rahma or Mount 'Arafat. Didn't climb it this time around because of my current condition but I am blessed I managed to climb till the very top the first time I was here in 2012. Alhamdulillah, I was blessed with a miracle over there. Apart from the official treatments, the alternative meds, the numerous supplements, other aids and accessories such as the pants that was supposed to help me walk better, and most importantly the prayers from the ones who care and love me, a few knowledgeable Ustaz also reminded me that the Prophet has said that there is a cure for all diseases, except death. It is just that human beings may not have found the answer or the cure to it yet. Just like how 100 years ago certain diseases didn't have any treatments or cure. So there were 3 ustaz who gave me separate tips of amalan (deeds) for me to practice that I started to do in Makkah. All praises to the Almighty that my condition improved especially in my last two days in Makkah and in Madinah where I was finally able to walk again and I had lesser need for the wheelchair. I am still in a lot of pain even with daily doses of painkillers but at least I was less immobile, able to move and walk more than before. I was able to walk to and fro the hotel and Nabawi Mosque (it helped that the hotel was really close to the women's gate) and I was able to walk with the help of the crutches when we visited some places around Madinah. Till now, I require less use of the wheelchair except for when its long distance. Alhamdulillah. 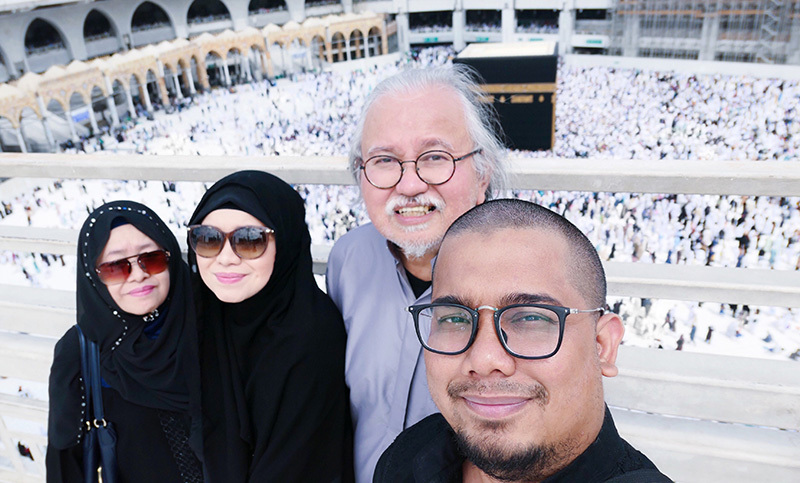 Maybe I will share more about the umrah trip in another post but here in this post I will just share some memorable photos of the trip. It is a dream come true to go and even more of a dream is to go with my parents. Its been a silent dream since my first umrah trip in 2012. 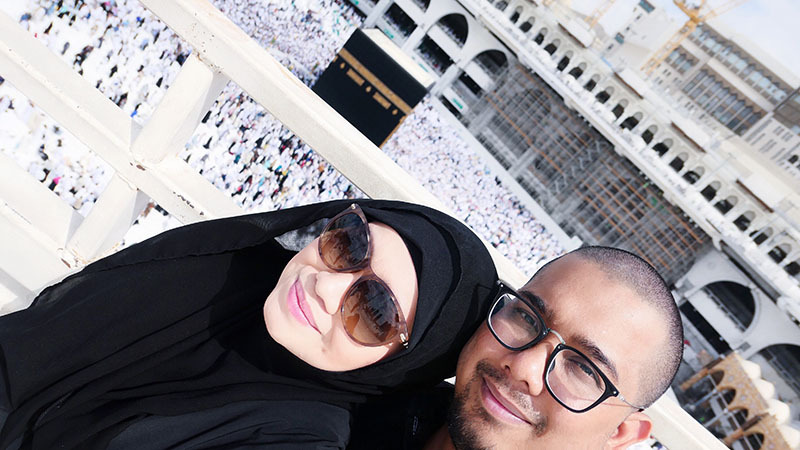 Oh wait, I did mention it in "Soulship 2 : Preparation & Start of a Journey" which I posted 4 years ago on 9th march 2015 below a photo of me and my mom, I said, "I hope next time I will get to go for umrah with my parents too :) InsyaAllah." It came true. Prayers and du'a do come true. He decides when it will happen with His perfect timing. All praises to the Almighty. Before I started writing this post, in my mind I wanted to start the post in an exactly different way but last night around after midnight, I went through some of my older postings. I wanted to title this post "I AM BACK" and when I stumbled upon the post "I AM HOME", the introduction was exactly the same idea. And I realised how even though its been almost 7 years since I posted that blogpost 30th June 2012, but most of the things that I wrote there is almost the same with what I wanted to write for this one. (So, I made sure that I don't repeat the intro. The feelings are similar and resonate the same. Of course now the circumstances are different but I'm just so glad that I wrote that post back then as a reminder to myself of how I felt at the time. I don't deserve all these blessings but I am extremely grateful for the rezeki to be able to go again, despite the odds. Alhamdulillah. Other than umrah, another unexpected blessing happened in March which I will share about soon. Why did I title this post Reborn? When I looked back at the moment I was first diagnosed last year, that 2 days seemed like I was dead: spiritually, mentally and emotionally. Dead. I almost gave up. When I look back throughout what has happened in my life, this is not the first time that this has happened. I have gone through a number of things that made me feel numb, sad, angry, in denial, and sort of lost hope before but somehow, somewhere after a fall even though it might take sometime I somehow always get back up. Even at times when I secretly thought won't be possible for me to go on anymore. I am blessed because God saved me. He brought me out of despair. He blessed me with gifts. He made me realise the little big joys. He opened up my eyes and reminded me of what really matters. He reminded me, again and again through the trials and tests that life is short and everything is temporary. He blessed me with unexpected gifts. He made me feel less alone even when I was physically alone. He made me feel love all around and more importantly, His Love. He sent people to help me out through the trying times. I am blessed because of the support system that I have around me. All of these and more makes my heart full. And slowly, I was reborn. Eventhough physically, my body is in pain and might seem weak, He has lifted my spirits and bring me to a better place emotionally, mentally and spiritually. O God, make it consistent and make it better. Grant ease throughout our hardships. I realise now, each time I'm hit with a hardship in the past, I am REBORN. Felt this now and a few times in the past. But this time it is more significant. This life is filled with pain and suffering but it also filled with joy and blessings. It is the fact of life. I am human. Behind every photo, there is just so much pain that I had to go through just to take that picture, but there is also joy. I love to capture memories. When I look back at them, it makes me smile and it reminds me of the things that I should always be grateful for. There is suffering but there is also blessing. The only place where there is no pain and suffering is the place that we all pray to go to and strive to go to. Lets pray that all our hardships, test, pain and suffering in this world will be rewarded in the Hereafter. By the way, above is a photo of me at the exact same spot where I took the photo that I shared in my post "I AM HOME" which I posted on 20th June 2012 after I came back from my first umrah trip almost 7 years ago. How things have changed so drastically since then. With that I end my post with one of my favourite verses of the Quran and I'm sure many of you too that have helped me gone through the worst throughout the years. I got it from the MyDuaa app introduced by Yasmin Mogahed when I went to her talk last year and have been using it daily because its so cool and awesome. "I seek refuge in Allah from Satan the outcast. the One Who sustains and protects all that exists. Neither slumber nor sleep overtakes Him. To Him belongs whatever is in the heavens and whatever is on the earth. Who is he that can intercede with Him except with His Permission? He knows what happens to them in this world, and what will happen to them in the Hereafter. And they will never encompass anything of His Knowledge except that which He wills. and He feels no fatigue in guarding and preserving them. And He is the Most High, the Most Great."